Remember those glow-in-the-dark stickers you had when you were a kid? They had to be “charged” in sunlight all day and would only glow for maybe 1 or 2 hours at the most. A research group at the University of Georgia has created a persistent phosphorescence material (i.e. glow-in-the-dark material) that has an “glow”, also known as the afterglow, for more than 2 weeks after exposure to sunlight for only a few seconds to minutes. Moreover the afterglow emitted is designed so that it can only be seen with night vision goggle, making for some interesting applications. To understand how phosphorescence materials work, we must dabble in a little bit of quantum mechanics. To begin, we should bring up Bohr’s model of an atom (shown below) from high school physics. 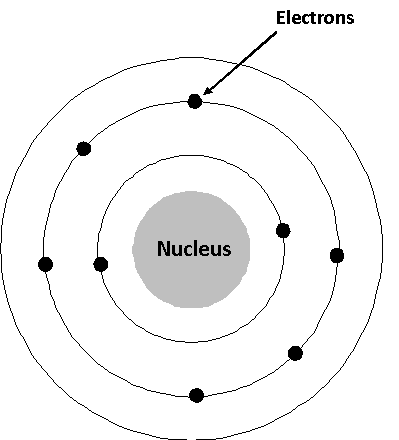 In Bohr’s model, electrons are perceived to occupy orbits around the nucleus at a certain distance. Although Bohr’s model is not an entirely accurate description of an atom from the point of view of modern quantum mechanics, it does demonstrate an important point: electrons orbit the nucleus at specific energy levels. But now in a material with billions of atoms, the specific energy levels broaden into a range of energy due to the interaction of electrons from different atoms (Randall & Wilkins, 1945). One can visualize this with the use of a band diagram, shown below (and borrowed from wikipedia). 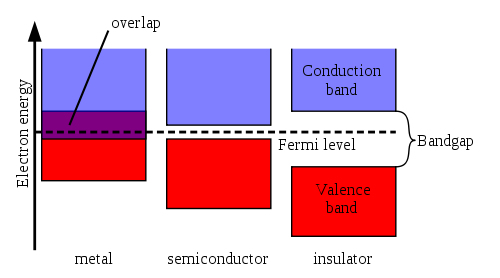 The lowest band is called the “valence band”, this is the energy range of the valence electrons in the material. We can also draw the energy range for the lower energy electrons (i.e. those that are found closer to the nucleus) if we wish. 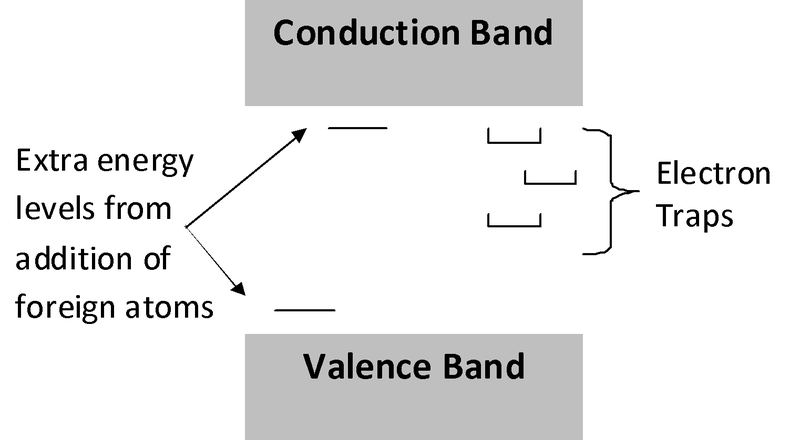 The highest energy range is call the “conduction band”. In this range, electrons have enough energy to be freed from the nucleus and can move around in the material (Randall & Wilkins, 1945). The area in between is call the “band gap”. Electrons can be promoted from a lower level to a higher level with energy input from an outside source (e.g. x-rays, light, heat, other electrons, etc.). 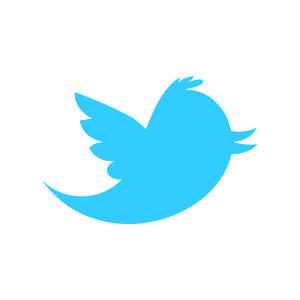 Promoted electrons are considered to be in a excited state (i.e. of higher energy). However, these promoted electrons will soon fall back to the valence band, to a state of lowest energy. But what happens to the excess energy that the electron had from being in the excited state? Well, the energy is emitted out of the system in the form of an electromagnetic wave, which can be x-rays, infrared, photons (packets of light) depending on how much excess energy is emitted. That is the basic idea of phosphorescence. Photons hit the material, promoting electrons to a higher energy state. The promoted photons then fall back to the lowest energy state, emitting the energy difference (falling from high to low energy state) in the form of the “glow-in-the-dark” light. However, this burst of “light” would happen really quickly. As a side note, you can actually use the electron band theory to understand many other phenomenons like why metals conduct electricity, how semiconductor works, and so on. Energy levels can actually be added within the band gap as shown below. These energy levels in the band gap can result from material defects (like missing atoms in the otherwise organized atomic structure), or the addition of foreign atoms. Material scientists do have some control over where these energy levels are and their behavior, by playing with the type and amount of foreign atoms. Some foreign atoms may create energy levels called “traps” or “electron traps” (Randall & Wilkins, 1945). These traps capture electrons in the conduction band, and hold them in a relatively stable state, preventing electrons from going back to the valence band immediately. Usually, electrons are only dislodged from the traps through thermal agitation (i.e. energy input from temperature being higher than absolute zero) (Randall & Wilkins, 1945). Band diagram showing the extra electron levels found within the band gap with addition of foreign atoms. The electrons spend time in the electron trap before falling back to the lowest energy level and that is the reason why the material emits light long after the room lights have been turned off, hence “glow-in-the-dark”. The group at the University of Georgia used a more complex ceramic material (Zn3Ga2Ge2O10 : 0.5%Cr3+;A.K.A. zinc gallogermanates) to make their long lasting persistent phosphorescence material (Pan et al., 2011). 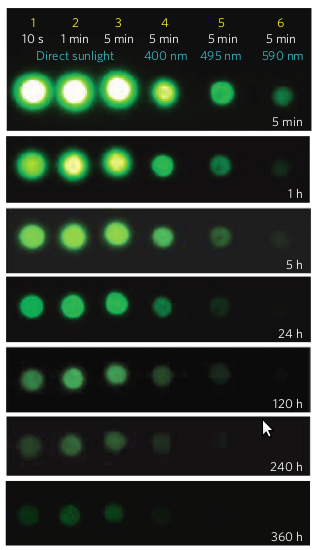 The persistent phosphorescence material created by Pan et al. (2011) emits light with wavelengths between 600-1000 nm, that is almost entirely within the infared part of the light spectrum. As a result the light emitted can only be seen with night vision goggles. ZnS:Cu, is zinc sulfide with a small amount of copper added to create the necessary energy levels within the bandgap. It is one of the most commonly used materials for “glow-in-the dark” consumer products (Matsuzawa et al., 1996). This material emits light at the traditional green color we’re used to seeing and the light doesn’t last more than a few hours at best (Matsuzawa et al., 1996). Sometimes a small amount of cobalt is also added to make the afterglow last longer (Matsuzawa et al., 1996). A 10 second charge under direct sunlight for a solid disk of zinc gallogermanates created by Pan et al. (2011) emits infared, that can be seen with night vision goggles, even after 360 hours or 15 days in the dark. Pan et al. (2011) believe that the longevity of the afterglow of their material is due to the many electron traps created by the addition of the Cr3+ ions that are spread throughout a wide spectrum of energy levels. The zinc gallogermanate can also be produced in a powder form that can be Incorporated into various types of paint (Pan et al., 2011). The major disadvantage is that the intensity of the after glow is a lower and shorter time of emission (Pan et al., 2011). To demonstrate, Pan et al. mixed a batch of paint with their zinc gallogermanate powder and painted a University of Georgia logo, pictured below. After 5 minutes under direct sunlight, the afterglow of the paint can last longer than 24 hours (Pan et al., 2011). Pan et al. have even shown that this material is rugged and can still work underwater (tap and salt water) or even a more corrosive bleach mixture, and still be able to emit lights as if it was in air.The zinc gallogermanate has also been field tested under a whole range of conditions by Pan et al. (2011). The zinc gallogermanate can be charged quickly in all sort of weather (e.g. sunny, cloudy, overcast, rainy, and so on), during anytime of the day, at any location (even in the shadows of trees and buildings), and still demonstrate similar long lasting afterglow. Pan et al. believe their persistent phosphorescence material can be use in many important applications such as: acting as tags/markers for night rescue operations; used to collect, store and convert solar energy; or even acting as a probe for bio-imaging. ** Guesstimate for a “few” hours mentioned in (Matsuzawa, 1996). Matsuzawa claims the afterglow of their material last more than 10 times that of the ZnS:Cu, Co material. ← Science keeps frozen puck afloat—not magic! I wanted to know if this material is able to be purchased where can you purchase it and how much it is per gallon .and I would love to get feedback on .on this the product thank you sincerely riley. As far as I know, Riley, this glow in the dark paint is still in the research stage. I don’t think it is available for consumer purchase at the moment. But thanks for your comment! I really get so damned tired of crap spoken of-and NEVER placed on the market. Please stop talking of things that we can not even have-it’s ridiculous! To home brew the glow in the dark paint? I’d think It can be quite difficult without the know how and/or the proper equipment. From my understanding, even a very small variation in the composition of the particles can affect its properties (e.g. efficiency). Furthermore, it’s likely that these powders have to be pretty fine in dimension to give a uniform glow. buy glow sticks at the dollar store; activate them,then carefully cut 1 end off with a razor knife and dip brush or just splatter all over clothes and walls and ceilings with a bunch of drunk friends and turn out the lights.safety glasses recommended. What an amazing trip.However just like anything you splatter all over and don’t clean up immediately;it stains.Have fun! Hi there, wanted to know if this can be done in fabric form? SURE WILL BE HAPPY TO BUY THIS.I WOULD LOVE FOR MY CEILING TO GLOW ALL NIGHT LONG.HOW WILL I NO WHEN ITS ON THE MARKET?? ?